It’s been a while since we shared an update with you and through this post we would like to share our immense pleasure. 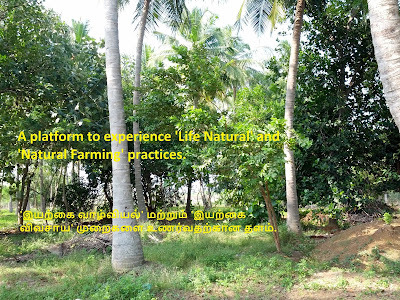 Ever since we started reading ‘Moonraam Ulagappor (Third World War)’ series by famous Tamil Poet Mr.Vairamuthu in Ananda Vikatan magazine, we got the quest for Natural Farming. For the past five years we had been searching for a land to practice it. Recently, with nature’s blessings we got a farm near my husband’s native, meeting all our expectations. We have named this farm as ‘Living Forest’ and its location map is given below. Map includes farm photos as well. We take this moment to extend our heartfelt thanks to Mr.Kannan, my husband’s elder brother and Mr.Amulraj, our family friend who have helped us find this farm after several years of search. We also thank all those people, who have planted and nurtured several trees with little to no chemical inputs. We also thank all our well-wishers who have been a constant source of encouragement to our endeavors. We expect your continued support and wishes for our future endeavors as well. At present, this farm consists of Coconut, Dwarf Moringa, Sesbania, Jack fruit, Mango, Guava trees which are yielding. We are planning to practice, ‘Do Nothing Farming’ preached by Late.Mr.Masanabu Fukoka and ‘Natural Farming’ practices taught by Late.Mr.Nammalvar to nurture this farm. We are looking at meeting our needs on Fruits, Greens and Vegetables to lead a sustainable living. We are trying to bring biodiversity as the name ‘Living Forest’ depicts, by growing wide range of plants and trees, which would in turn attract and provide shelter to other living beings. We are also planning to develop this forest as a platform to experience and practice ‘Life Natural’ practices which we learnt from Mr.G.Balakrishnan. By practicing ‘Life Natural’ one would understand the proper way of consuming poison free natural produces leading to holistic health. This platform will facilitate like-minded friends who are in search of health, to come and stay with us for few days and learn these practices. We will keep you posted on further developments in future posts.